As our waste stream continues to expand at an ever-increasing rate, we need to look at reclaimed and recycled materials as a resource for building. 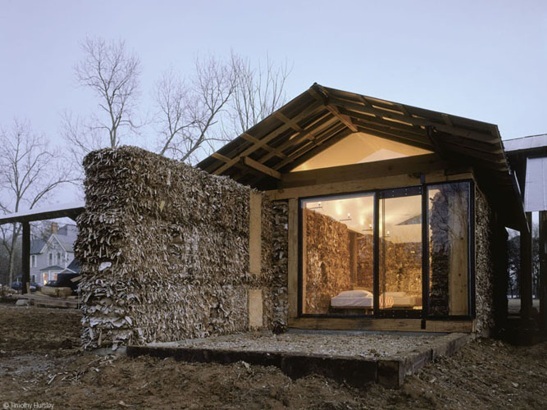 One ingenious solution is to use waxy corrugated fiberboard bails to build house walls. The stuff is hard to recycle (unlike non-waxed corrugated board), but bails of it could be great for building walls. A small team of students at Auburn University sought to prove the material’s viability as a construction product by creating a functional small building. This student housing is the result of their investigation. A quick note on terminology– cardboard is a single layer of thick paperboard; sandwich a sheet of wavy (corrugated) paper stock between two flatsheets and you get the strong and lightweight material known as corrugated fiberboard. Wax the surfaces and you have a box that resists chemicals and water — but unfortunately pollutes the recycling stream. As thousands of bails of the material goes to the landfill each day why not recycle it for use as building blocks? The Auburn students built a small student housing ‘pod’ by stacking the bails up like bricks then building a bond beam on top and a simple roof over that. For the foundation they buried bails wrapped in plastic and poured a shallow concrete base over that to support the walls. The r-value combined with the thermal mass of the bails makes for walls with outstanding energy performance. By the looks of it the building is almost overbuilt and could survive whatever is thrown at it. As far as fire, the bails may act similarly to straw bale construction, which performs much better that conventional framing for fire resistance. As our waste stream continues to expand at an ever-increasing rate, we need to look at reclaimed and recycled materials as a resource for building. 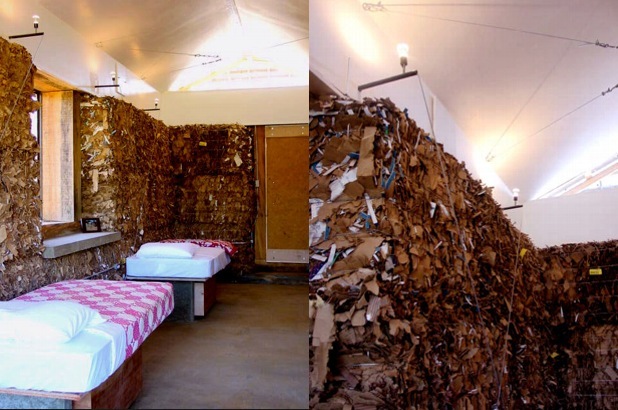 One ingenious solution is to use waxy corrugated fiberboard bails to build house walls. The stuff is hard to recycle (unlike non-waxed corrugated board), but bails of it could be great for building walls. A small team of students at Auburn University sought to prove the material's viability as a construction product by creating a functional small building. This student housing is the result of their investigation.